Under most presidents, during most periods in history, one true solace could be relied upon: that one individual, the President of The United States, could not single-handedly derail the economic destiny of the country; he could, however, help guide the nation along to a path of prosperity through strong economic policy (which in every past economic recovery meant getting out of the way of the private sector – through lowering taxes and regulation). Sadly, under Obama, strong economic policy, from my entrepreneurial perspective, has faded in America. There is a new reality, hammered together over the last five years in the wake of the global financial meltdown. While the US economy navigated tumultuous waters in 2009 and 2010, it was in spite of the present White House occupant and mostly a result of the Fed’s easy money policy. In reality, Obama managed to place the US at such tactical disadvantage by indecision, poor economic understanding and even poorer legislative prowess, that the future of the country is in almost irrecoverable shambles. Ronald Reagan, the 40th President of the United States. than during the same period of Obama’s first term. The inflation rate when Obama took over was near zero. When Reagan took over it was 12%. And most importantly, the Misery Index (inflation rate + unemployment rate) was 19.5 when Reagan took office and just 7.8 when Obama did. And for those keeping score, a lower Misery Index is better for the economy. I thank Richard Rahn at the Washington Times for all those numbers. During Obama’s first term the Liberals constantly tried to brainwash the public into believing it was the worst recession since the Great Depression (remember that sound bite? ), but the numbers say otherwise. Regardless, it is safe to say both Reagan and Obama inherited an economic bag of crap; but which of the two continually blamed his predecessor years after taking office? Isn’t the sign of a great leader one who is accountable and doesn’t look for scape goats? In his first term Obama spent his efforts ducking criticism, implementing a nationalization program (disguised as stimulus), keeping up with the joneses and pushing through a two thousand plus paged bill known as Obamacare (perhaps the biggest fiscal disaster of all). Reagan spent his first-term initiating policy to get the economy working again through lower tax rates (eventually dropped corporate tax rate by 14% and top income tax rate from 70% to 28%) and cutting back on onerous regulation. Remember, Reagan had a much higher inflation rate to deal with too, which makes it very difficult to encourage investment into small business. In an inflationary environment, people aren’t willing to be patient with their investment money – a requirement when investing in small business and creating jobs. While Obama inherited an economic mess – which he so mistakenly blames on Bush, despite it being, in large part, the fault of Clinton’s policy (but that’s for another rant) – he was given an opportunity to go down as one of the greatest presidents of all-time. These types of crises (subprime meltdown) come around every 25 to 50 years; a true winner and great leader knows to NEVER let a crisis pass you by. Great leaders are born in times of crisis and low morale. The national debt has increased by $5.07 trillion – almost $2 trillion more than what G W. Bush added in 8 years. Remember, Obama said that Bush was unpatriotic because of all the debt accumulated by the US under his leadership. 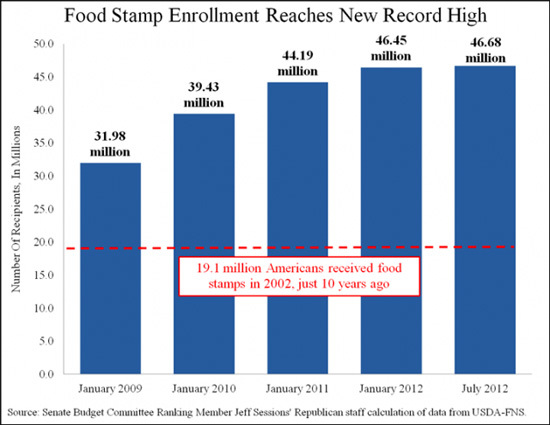 People on food stamps have skyrocketed from just over 28 million in 2008 to 46.5 million in 2012. If the US is in recovery mode, as Obama said during his campaign in 2012, then why has the amount of people on food stamps gone up every year since he took office? Under Obama 46 million Americans are now on food stamps – just ten years ago it was 19.1 million. A near trillion dollar stimulus package came and went with little to show for it in the way of new industry (which is what is needed for a true recovery to take place). Only 14 to 20% of it was spent on infrastructure, yet the President bragged about it creating ‘shovel ready jobs’. The stimulus package was spread so loosely, with pet projects and crony capitalism written all over it. But ‘don’t worry’ the Liberals said, we’ll be seeing the effects of this program for many years to come… sadly, so will American children when they have to pay for the horrible investment. If a fund manager made an investment with as bad of a return as the stimulus had, he’d be fired so fast his head would spin. The unemployment rate has decreased at a steady tick since 2010 but not because the economy is strong. Just over a month ago the labor force participation rate fell to 63.3% – the lowest level since 1979, which was the year Jimmy Carter was in power and the economy was already in shambles (soon to be rescued by Reagan). Tony Lee at Breitbart.com explains that when Obama took office the labor force participation rate was 65.7%. “This means 9,460,000 people have given up looking for work since Obama was inaugurated in January of 2009” stated Lee. The IRS scandal of potentially targeting Conservative groups (nothing has been proven, of course) is leading many to believe it was the result of orders from someone in the White House. A prominent former Obama aide admitted to CNN that she attended White House meetings with the IRS commissioner. Sarah Ingram, who headed the IRS’ tax-exempt division in 2010, has visited the White House 165 times since 2011, according to the Daily Caller. Douglas Shulman, former IRS commissioner, has visited the White House over 150 times since September 2009, according to the Daily Caller. The American Thinker reported that Mark Everson, who led the IRS under Bush, remembered only making one trip to the White House between 2003 and 2007. He also said that he felt like he’d “moved to Siberia” (while at the White House) because of the isolation. The significant issue facing America is that the world is standing at the genesis of a new revolution; this time it is the digital revolution. This revolution presents a choice and opportunity for the country. It needs to retool and take charge of the opportunity the way Republican leaders did at the midst of the last revolution and set America’s path for the next 50 years. Unfortunately, under the Obama administration, America is being campaigned to from one election to the next, with no clear path for the future. America’s leadership position in the world has been compromised. For those who remember Obama bowing before King Abdullah of Saudi Arabia, it represents a display of his vision for America – to be subservient. What he hopes to gain from this, I have no idea. Being subservient isn’t what made America great. LEADING is what made America great. To understand why Obama is – and will continue to be – the wrong President for this moment in time, we must examine another President that faced a similar opportunity. Ironically, it is President Lincoln, Obama’s stated ‘favorite President’. The reason Abraham Lincoln is apt as a comparison, is that he faced the dawn of a new economic age just as Obama does now. The difference between the two presidents is Lincoln was both the visionary who saw it coming, and was also the cause that made it happen. President Obama, on the other hand, is a spectator in this regard. President Lincoln’s platform for the economy was progressive for its time (which is what Obama claims to be). He erected high barriers to imports (controversial, I know), promoted banking – to be able to provide cheap credit for development – and he upgraded infrastructure. All three were so in tune with what happened a few years after he was assassinated. The country began its migration to an industrial giant without abandoning its agricultural roots, but modernizing them. Abraham Lincoln fulfilled the role of government superbly. He did not impede the free hand of entrepreneurs in what they wanted to do, but instead helped them by the effects of his platform and setting up advantageous infrastructure. 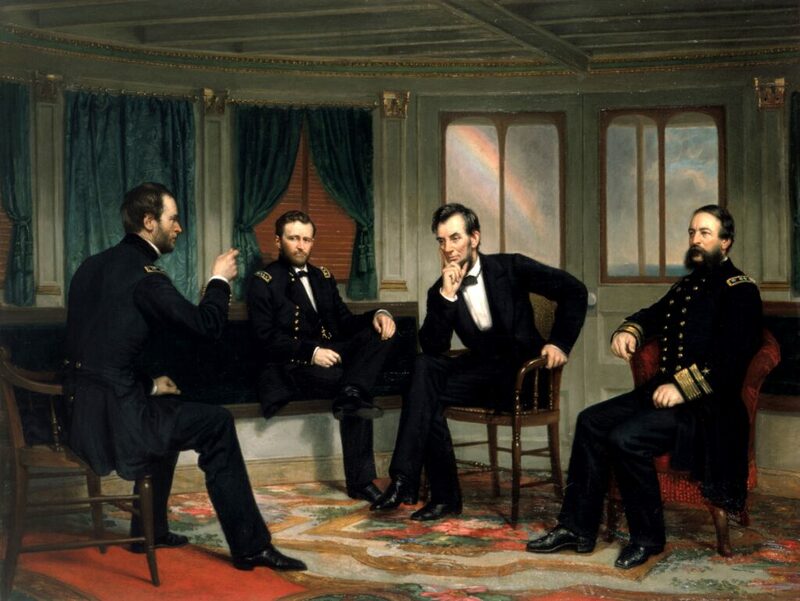 Lincoln’s simplicity echoed through time and the prosperity that ensued from that simple platform became the foundation for much of the prosperity America enjoyed as a result of the Industrial Revolution. During the cold war, the world entered its bipolar phase. A lot of the prosperity and leadership that had been gained from World War II had, by this time, been spent. It took another Republican, Ronald Reagan, to ‘tear down’ the Berlin wall and end the Cold war, leaving his opponent at the brink of collapse. 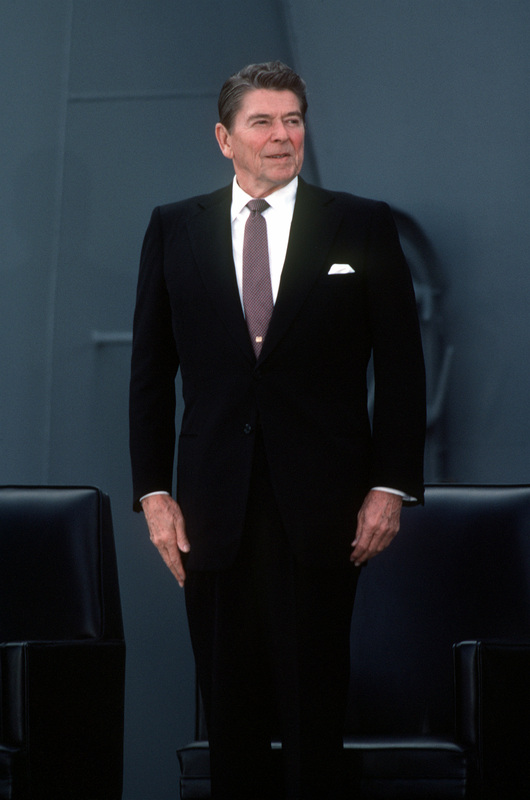 Reagan’s brinkmanship saw America rise into the 90’s as the sole world leader. Again, prosperity followed a crisis that was handled adroitly. Every time there was a crisis, great Presidents were able to look past politics and set up the country in a way that would convert the crisis to stellar opportunity and advance the position of America. Obama, however, missed his chance and the country is stuck with stagflation and a mediocre economy. We all know that a crisis was presented to Obama in the first year he took office. The Democrats would have us believe it was a left over from the Bush era; it wasn’t. But that’s a tale for another time. Even if it wasn’t his doing, Obama had the clout of pushing through legislation because his party controlled both the Senate and House for his first two years. The crisis in 2008/2009 was a golden opportunity for Obama’s legacy. He could have bettered the American economy. Unfortunately, during the early stages of his presidency, Obama went on his world apology tour. At the height of the crisis, just like when Lincoln faced his, Obama should have stepped up to appreciate the opportunity that presented itself. Even the highly liberal Nobel Laureate Paul Krugman was surprised at the level of indecisiveness and ineffective leadership Obama displayed. is an issue that needs to be addressed in America, but to make it your primary legislative focus during an economic crisis is, to say the least, untimely. A President that this generation needs, is someone who would have recognized the shifting paradigm and used the financial meltdown as a way to retool America. Look at China, where education, infrastructure, and competitive aggression has allowed China Inc. to nip at the heels of the American economy. This shouldn’t be happening. 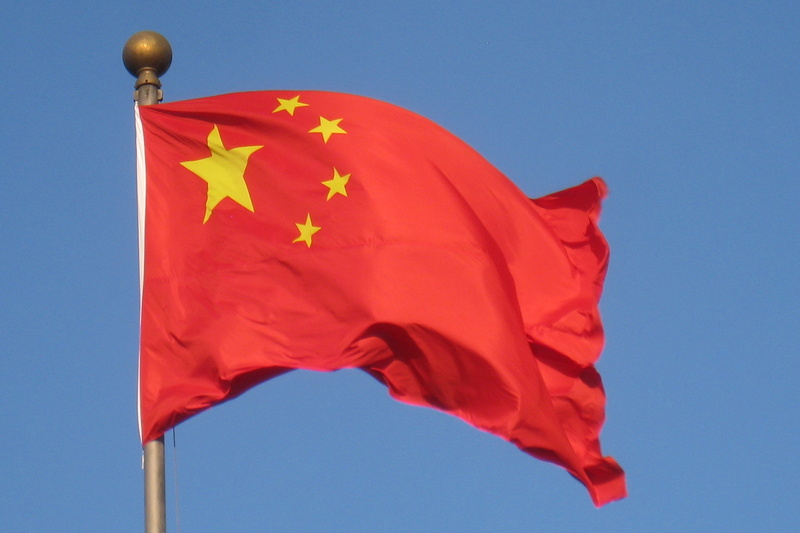 In 30 years, when China’s new electricity grids and advanced technologies are bearing fruit, where will the US be with its crumbling roads, failing infrastructure and broken schools, and not to mention the largest debt ever to burden the American taxpayer? Oh wait, California will have a high speed rail system in place… built in large part by the Chinese. President Obama had the opportunity to change the trajectory of a nation and take advantage of the new realities, but he failed. His policies and hesitance have placed America on shaky ground. But hey, his speeches were inspiring at times. He had the ability to raise hopes that something could be done and that he was the one to lead America. However, despite having the ability to illustrate the problems of America in great detail to anyone who will listen, he does not have the muscle to solve them. As much as this article is about Obama, it is also about a fading empire. While all of the country’s problems most certainly can’t be blamed on Obama, he did have the opportunity to rebuild the country for the better. America was once THE land of opportunity, where dreamers and entrepreneurs like myself strived to make it. Breaking into the US market with your product or service was the pinnacle of entrepreneurship. Now, I can honestly say that I view America to provide the same economic opportunity as countries like Canada, China, Germany and Brazil. It is still a great economy providing great opportunity, but it certainly isn’t alone at the head of the class anymore.